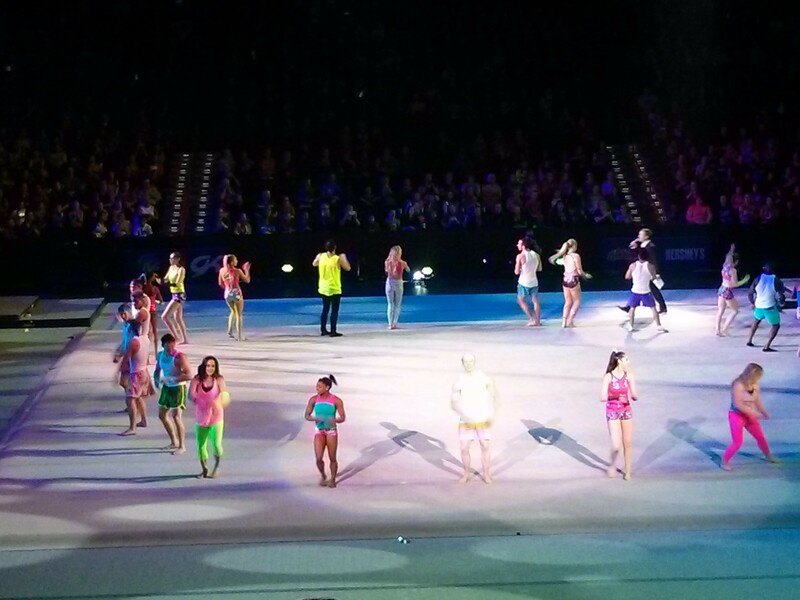 Four-time Olympic gold medalist Simone Biles, seen center left in blue, was naturally a crowd favorite. After tumbling their way to greatness last month in Rio, Team USA's gymnastics legends headed to Spokane last night to kick off the two-month Kellogg's Tour of Gymnastics Champions at the Spokane Arena. The mostly full Arena audience, which largely consisted of moms and their young gymnast daughters, were treated to appearances by gold medal-winning team members and fan favorites Simone Biles, Aly Raisman, Laurie Hernandez and Gabby Douglas. The team's uneven bars specialist and silver medalist Madison Kocian was not present last night, and as the tour continues for 35 more stops across the U.S., the performance roster is expected to change from city to city. Joining the 2016 women's team members were all five athletes on the men's Olympic team, along with twin sisters on the U.S.'s rhythmic gymnastics team, Jennifer and Monica Rokhman, the acrobatic gymnastics duo of Tiffani Williams and Axel Osbourne, and world championship medalists on the men's and women's sides. 2016 Olympic trampoline gymnasts Nicole Ahsinger and Logan Dooley were also in the cast of performers, as were past Olympic gold medalists Jordan Wieber, Shawn Johnson and Nastia Liukin. While the audience was undoubtedly ecstatic to see live performances by women's team favorites Biles, Raisman, Douglas and Hernandez — evident by the ear-splitting roar when they appeared on the arena floor — the perhaps unexpected stars of the night were the dozen or so male gymnasts, including the five-man Olympic team. The five-member men's Olympic team gave some of the show's most entertaining performances. In the show's first half, both Biles and Hernandez donned their red, white and blue team leotards to each perform solo their crowd-pleasing floor exercise routines, albeit with vastly toned down or non-existent tumbling passes. The choice to not have these world class athletes perform the high-flying flips and twists that made their skills-packed routines medal winning for Team USA may have been disappointing to the audience, but was understandable as these women will be touring the country for the next two months, performing nearly every other night in a sport that is often physically unforgiving. Let's also not forget the fact that they spent the better part of the past year or more pushing their bodies to the limit in preparation for the Rio Games. Fans were also treated to some abbreviated routines and acrobatic skills on the balance beam by the trio of Biles, Douglas and Raisman, and all the women gymnasts in the show displayed their strength and prowess on the uneven bars. 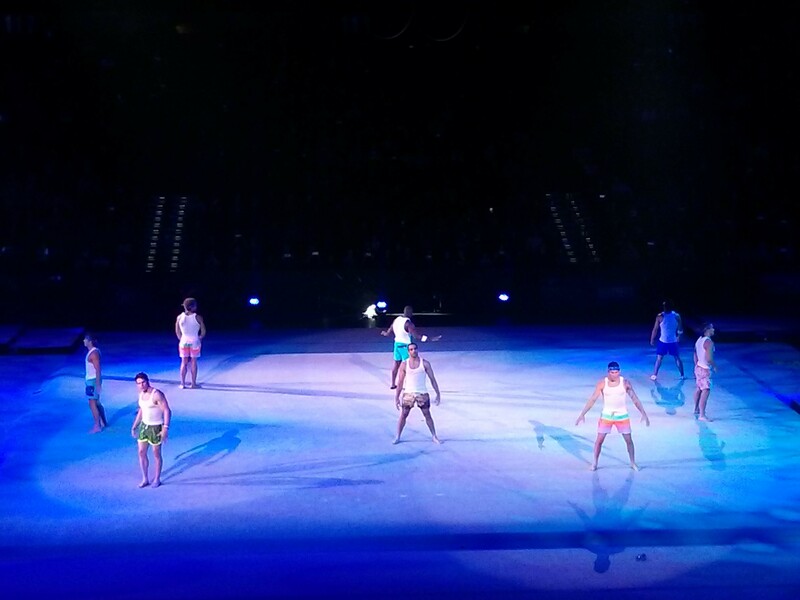 The male gymnasts proved that not only can they defy gravity with their acrobatic skills — they can also dance. Yet the crowd pleasers of the show turned out to be the upbeat and fun-themed performances of the men's team, who showed off their high-flying feats on the high bar during multiple intervals, and also tumbled, flipped and danced quite ably across the floor to various bass-heavy tracks, "Uptown Funk" being one. Throughout its two-hour run, all the lightheartedness of the exhibition style show — and the most impressive acrobatic skills — came from these incredibly fit and handsome 20-something men, much to the benefit of the predominantly female audience. During one segment, the men even invited some of the moms in the crowd out onto the floor to dance with them. 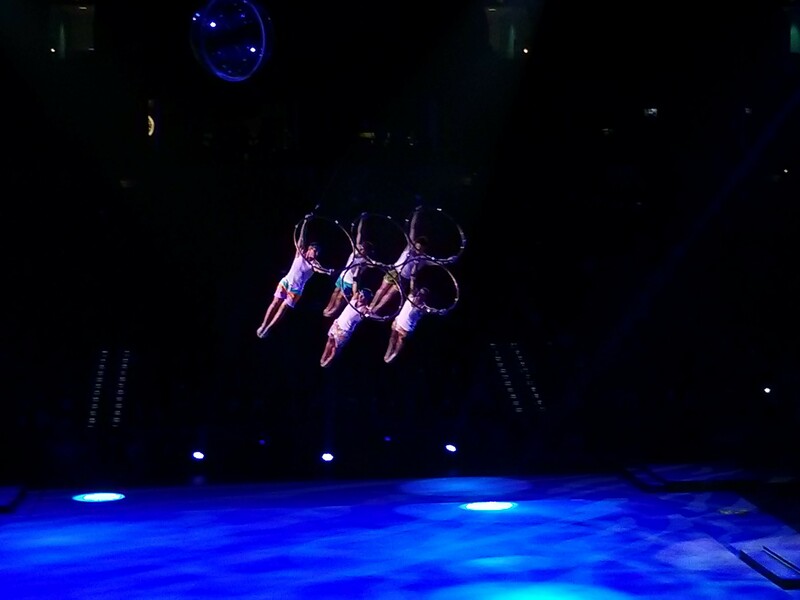 Other noteworthy moments of the Tour of Gymnastics Champions included the carefully balanced acro skills of the male-female duo Tiffani Williams and Axel Osbourne. Much like one might see during a Cirque du Soleil show, Osbourne tossed and balanced his tiny and insanely flexible partner Williams high above the floor with stunning precision and grace. While acrobatic gymnastics is not currently an Olympic sport, the duo won the pairs silver medal during the 2016 World Championships. Even if we didn't get to see Biles perform her signature tumbling move "the Biles" on the Spokane Arena's floor, it was obvious that just about everyone who attended last night's tour kick off were beyond star-struck. By night's end, the inspired mindset of hundreds of local gymnasts — feeling renewed motivation to work toward their own high-achieving gymnastics dreams — was palpable. Sat., April 20, 9 a.m.